Vol. 1, no. 1 (July 15, 1854)-v. 1, no. 37 (Apr. 11, 1855). Printed in Saint Mary, Iowa, July 15-Nov. 8, 1854; Bellevue, Neb., Nov. 1854-Apr. 11, 1855. The Nebraska Palladium, while short-lived, is considered to be the first newspaper ever printed in the Territory. Although officially a Nebraska newspaper, the Nebraska Palladium was initially printed in July 15, 1854, in St. Mary, Iowa. At age 25, its founder Thomas Morton was already a seasoned newspaperman. While in his early teens, Morton had trained as a printer in Kentucky, at the Louisville Daily Democrat and the Louisville Courier. In 1849, gold fever took him to California. Unsuccessful in the gold fields, Morton worked for a time on newspapers in California and in Mexico, where he was employed by a Spanish-language newspaper. Morton eventually moved to the Missouri River valley where he acquired the printing press on which the Palladium was typeset. On November 15, 1854, the first issue of the Palladium was published in Nebraska at “Bellevieu City” or Bellevue—once the press had been moved across the Missouri River. 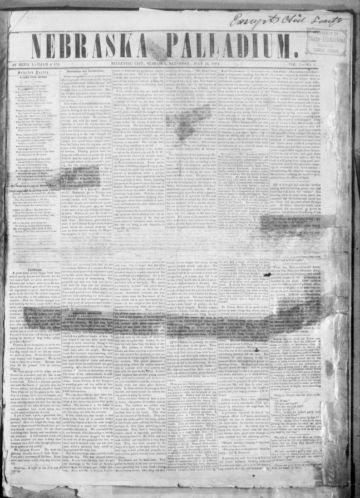 The last issue of the Palladium was published on April 11, 1855, when Thomas Morton moved his press yet again—this time to Nebraska City where he collaborated with J. Sterling Morton, another well-known Nebraska newspaperman. Although not related, Thomas and J. Sterling Morton both shared Bourbon Democrat political leanings. Their newspaper, the Nebraska City News, is now the oldest newspaper still being produced in the state.